Diamonds are a girl’s best friend and we just LOVE these diamante designs from Little Angel Weddings! ‘Chelsea’ style is a design suite which is sure to add that extra sparkle and luxury to your wedding day. The invitation design is a simply elegant layout – a DL fly card in laid white or cream, finished with a satin ribbon in the colour of your choice and a beautifully sparkling diamante embellishment. Choose from a diamante or square/ diamond cluster or a pretty circle or heart-shaped cluster. These embellishments are stunningly pretty and need to be seen to be fully appreciated. 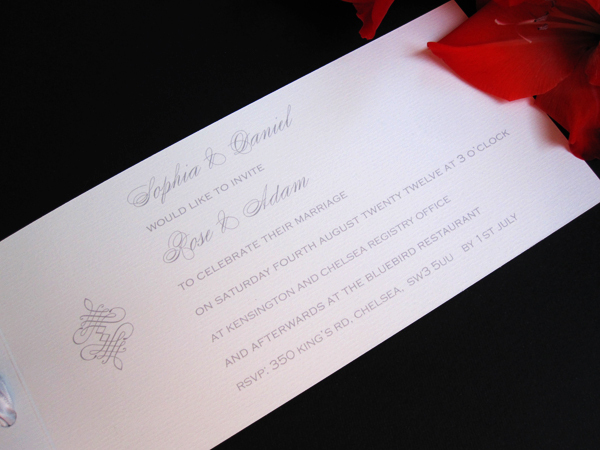 The invitation costs £3.55 and is available in a range of fonts and colourways. Since the design is brand new, we are able to offer WIS readers a special 10% discount on the design for all orders in the month of October. Just email us at info@weddinginvitationshop.co.uk and quote ref WISOCT to receive your fabulous 10% discount! Samples are charged at £3.55 plus 95p P&P but the cost of up to two samples will be redeemed should you go on to make an order. Happy Valentine’s Day to all of our wedding couples and designers! To get you in a romantic mood why not take a look at our latest inspiration board for some great ideas for heart wedding invitations. You could add heart embellishments to your invitations or incorporate hearts of different colours into your print design or motif. Or why not wrap the invitation in satin ribbon and tie with a diamante heart for a truly luxurious, romantic effect! 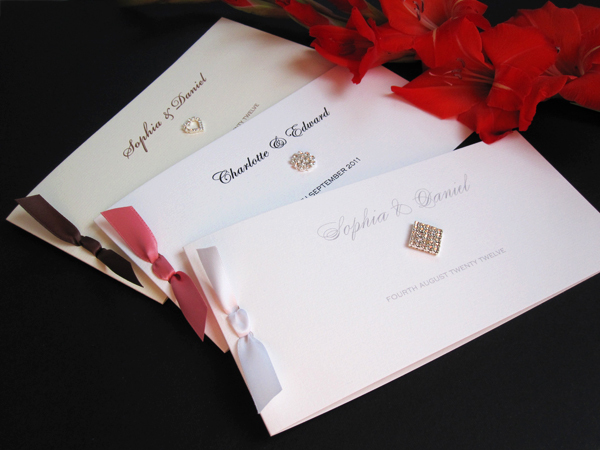 Diamante Wedding Invitations – diamonds are forever! Diamonds are a girl’s best friend and if sparkle and bling are your thing, you will just love these diamante wedding invitations! 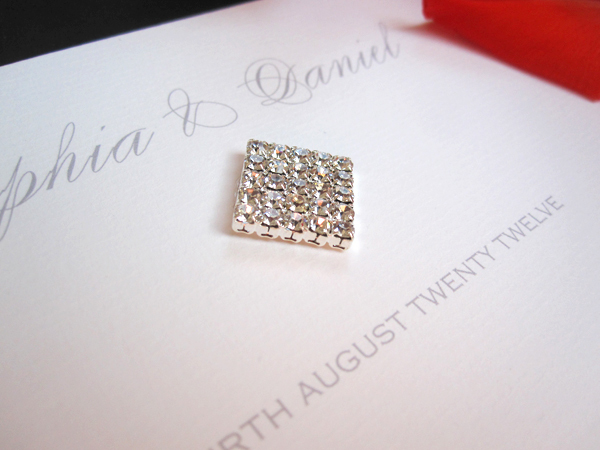 If you are looking for a very subtle effect why not add a Swarovski crystal or two to your invitation to add subtle sophistication? Diamante ribbon sliders can be added to satin or organza ribbon for a truly luxurious feel. Or go for the full glamour effect with a wide range of diamante brooches and embellishments – from vintage brooches to sparkling snowflakes and butterflies, diamonds can be incorporated into almost any style! The brooches and diamante look can run throughout your wedding theme from your wedding stationery to the wedding decorations, venue styling and wedding breakfast. You can add matching diamante ribbon sliders to your wedding chair bows, flower arrangements, favours, table plan and even the cake! So bring in the bling and scatter your wedding with delicious diamonds! © 2019 Wedding Invitation Ideas Blog|ProPhoto theme by NetRivet, Inc.